Fred Joiner is a poet and curator. His work has appeared in Callaloo, Gargoyle, and Fledgling Rag, among other publications. Fred has read his work nationally and internationally. 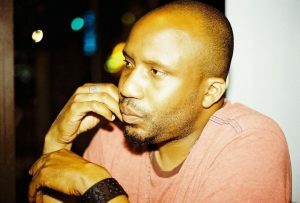 Fred is a two-time winner of the Larry Neal Award for Poetry and a 2014 Artist Fellowship Winner as awarded by the DC Commission on the Arts and Humanities. One of Joiner’s poems was selected by curator and critic A.M. Weaver as part of her 5 x 5 public art project, Ceremonies of Dark Men. Another of Fred’s poems won the Smithsonian’s National Museum of African Art’s Divine Comedy Poetry Contest, in response to Abdoulaye Konate’s textile work. As a curator of literary and visual arts programming, Fred has worked with the American Poetry Museum, Belfast Exposed Gallery (Northern Ireland), Hillyer Artspace, Honfleur Gallery, Medina Galerie (Bamako, Mali), the Phillips Collection, the Prince Georges African American Museum and Cultural Center, the Reginald F. Lewis Museum, and more. He is the co-founder of The Center for Poetic Thought at the Monroe Street Market in Brookland, and he is a board member for The American Poetry Museum.